Our priority is to provide you with the appropriate care and desired styles you deserve without damaging your scalp or hair. We are very professional braider with many years of experience and we always use quality products in our shop. 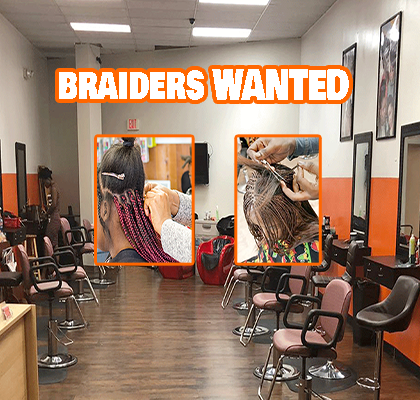 After many years of braiding back home in Africa, Shalom has been braiding in the USA from Chicago, to New York , Detroit to Atlanta and now moves her expertise to Little Rock. We have a very relaxed and professional environment to make you feel comfortable as soon as you step into the shop till the time we finish your hair. We provide customers with refreshment to make your stay as much as pleasant as possible. We also have a free WIFI for your phone and laptop and we have a collection of movies you can choose from. We are listing and always be listing to our customers gentle suggestions for an ongoing imporvements of service to you. We can not wait to see you at New Star. May God bless you for the time spent on our website. Please check some of the styles you can expect at the gallery page.